Shannan Martin Writes: Get Your Falling Free Bonus Freebies! When Summer vacation began, roughly two-and-a-half blinks ago, I had resolved to be "done" writing for a while. And I was, and I have been, and it has been absolutely glorious to have a break and to not stress about finding time to work while my kiddos are be-bopping around the house, causing all manner of chaos and cuteness. But I have had some stuff to do, and at first it took me off guard, like, "Waaaait a minute, why am I staying up late doing stuff when I'm not supposed to be doing anything?" I had hit the busy-work phase of launching a book, and I wasn't sure how to process it. Is this fun? Is this work? Can it be both? Because it totally is. In the wee hours of the morning/(night) and in stolen moments here and there, I put together a bunch of fun freebies for anyone who pre-orders a copy of Falling Free: Rescued From the Life I Always Wanted. Some of them are typical (you can automatically download the first two chapters of the book...as in, TODAY!) and others speak to my weirder side (a tour of my home, including the kids' rooms which were filmed in their "native state"). But all of the freebies, every single one of them, is F.U.N. I wanted to be sure they were things that would be very "Shannan", bonuses I would be interested in myself. 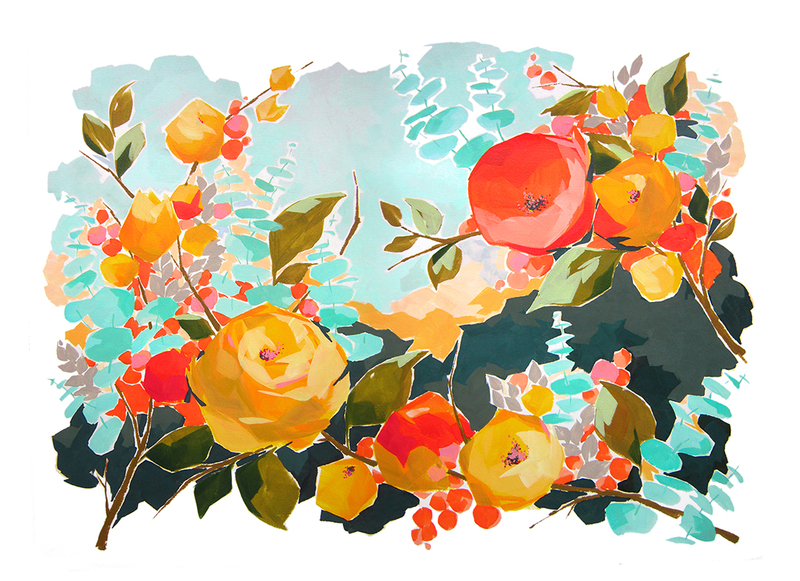 * A high-res, downloadable fine art print from Jess Franks, one of my favorite artists on the planet. I printed mine off on a 2'x3' rolled canvas and tacked it over my couch. I can't stop staring at it. But back to the pre-order skinny. If you order five copies of Falling Free (book club! church group!) you get all of the above AND a discussion guide, a recipe book of my favorite recipes, and an additional free signed copy. I enjoyed putting this together for all of you so very much. It's a tremendous honor to have your support and if I can offer back some legit artwork and a video of myself with bad hair, well, it's the least I can do. To pre-order, click over to the Falling Free Book website. (There are several options for where you'd like to pre-order.) Then, to redeem your prizes (I feel so very The Price is Right!) just enter your order number and the retailer where you ordered. The goods will be emailed directly to you. For those of you who have already pre-ordered, just dig through your email, find your receipt, and punch the order number in! Just to clarify.....by receipt code do you mean the order number? Blerg, yes! I will make that change. Thank you, K! JUST ORDERED! So pumped. So very pumped. Hey friend, just click on the website up in the post (fallingfreebook.com) and enter it all there. Thanks! Walking through your house with you- so fun! Loved seeing sriracha in your fridge and seeing all the little things that make your place colorful and you! Love the print from Jess Franks, I about cried while watching the trailer for your book (that picture of Calvin, I think, running- all the weeps), and I'll be reading those first two chapters as soon as I'm done with your tour! Love this so much! Where does Robert sleep when he comes home? And little ones? (I mean, you opened your fridge, so I feel like I can be nosy?! Ha! And I'm so excited about that print! I just went to your gorgeous book website, read the synopsis of the book, and now I'm crying. WHY?!? I don't even know but I'm just feeling all the feels about this one. Sending all the love and support your way, my friend. That print is lovely. May I ask where you got it printed? I ordered way back on the first day of pre-order, so excited! 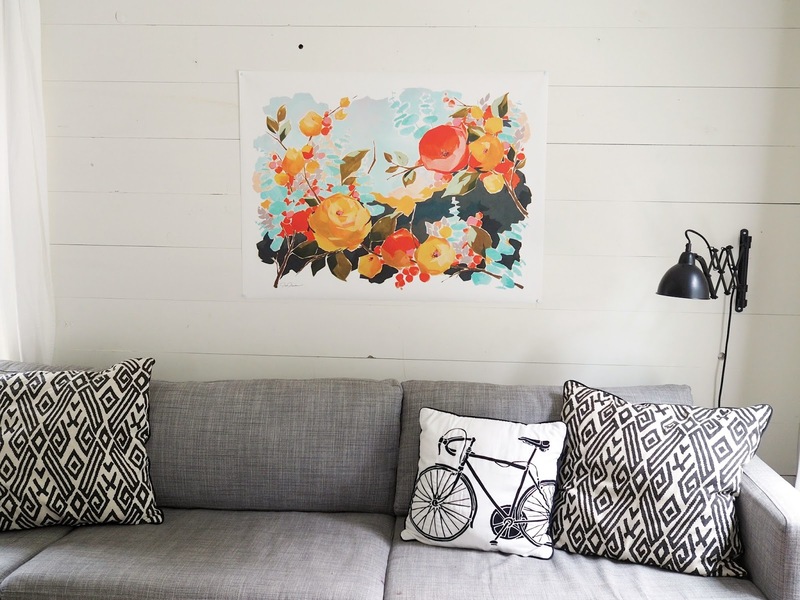 I have to know, how and where do you just print that gorgeous artwork on a canvas? I need instructions! Thanks! I haven't used them yet so I can't testify to their quality, but as I was looking around I found uprinting.com has great prices (think less than $40 for a 2'x3' print) for rolled canvas prints. okay, so i didn't think i was going to enjoy the house tour as much as i did, but that was so fun to see you in your space! and it IS a lot smaller than it seems on the blog. LOVE the backyard too. that playhouse is AMAZING.